The Pacific Coast Highway, also called California State Route 1, Coast Highway, or shortened by locals to be "PCH," is 650 miles of road. 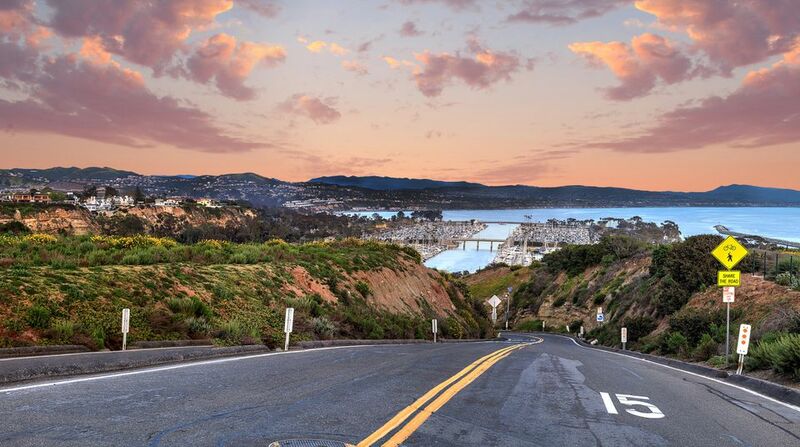 It connects the beautiful harbor town of Dana Point in southern California's Orange County to Leggett, California, in Mendocino County, home to some of the largest trees in the world. But if you want to travel California State Route 1 from end to end, or if you are the type who goes down a street just to see what's there, there's plenty to explore along the Pacific Coast Highway in the Los Angeles Metropolitan area. While driving this stretch, food is easy to find as is gasoline (and anything else you might need). Technically, Orange County is considered a suburb or part of the LA Metropolitan area. Pacific Coast Highway's southern terminus is at Interstate 5 in Dana Point. It runs 40 miles between there and the Los Angeles County line just north of Seal Beach. Going north from Dana Point, California State Route 1 is called simply Coast Highway through Laguna Beach and Newport Beach. The first glimpses of the Pacific Ocean start in south Laguna Beach. People in Newport Beach seem to think it is better to live on the beach than to see it while driving by. Houses and businesses between the road and the shore block your view much of the time. For a fun detour along the way in Newport Beach, take Balboa Boulevard (if you are going south) or Jamboree Road (if you are going north) to the Balboa Peninsula and Balboa Island, taking the charming little three-car ferry boat between them. After a quick drive to the end of the Balboa Peninsula, return to Coast Highway to continue. 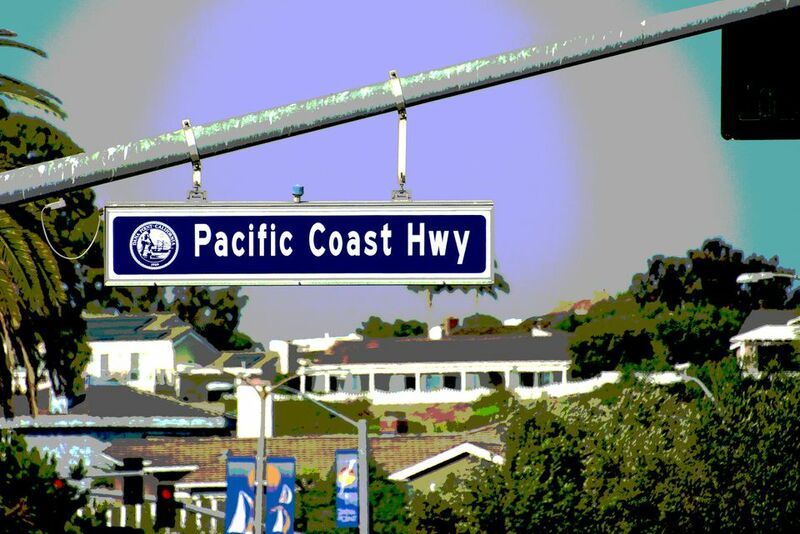 The road name changes back to Pacific Coast Highway through Huntington Beach and Seal Beach. Once you reach Huntington Beach, you can see the oceanfront all the way to the Los Angeles County border. North of Seal Beach, the PCH crosses the Los Angeles County line. From here, you will continue another 35 miles to Santa Monica. As you pass through Long Beach and Torrance, the Pacific Coast Highway runs inland going west, then turns north through the South Bay cities of Redondo, Hermosa, and Manhattan Beach, where the road changes its name to Sepulveda Boulevard. North of Los Angeles International Airport, the highway becomes Lincoln Boulevard through Marina Del Rey, Venice Beach, and Santa Monica. However, it seldom gives even a glimpse of the Pacific Ocean. What it does give is a peek at a cross-section of southern California life as it passes used car lots, car washes, apartment buildings, and strip malls. On the west side of Long Beach, the road will even take you past an oil refinery. For a better ocean view and a more scenic glimpse of Southern California beach life, take a detour in South Redondo Beach. Go west on Avenue I from Pacific Coast Highway, then turn north and stay as close to the water as you can (Esplanade to Catalina Avenue). Once you take the scenic route along the water, you can hook right back onto State Route 1. Once you've reached Santa Monica continue driving on the Pacific Coast Highway up through Malibu—this next stretch is where you start to see the scenic PCH from countless Hollywood movies. This map shows the route of the Pacific Coast Highway from Orange County to Santa Monica. You can see where sections of the road veer inland away from the coast. For pretty oceanside views, the PCH is not your best bet while in LA County. But, if you are dead set on traveling along the water the entire way, get off the Pacific Coast Highway while in LA, and take the streets along the water. You should be able to see the big blue waters of the Pacific and drive parallel to the ocean. For beautiful scenic driving on the PCH, continue on to Malibu. Or if you have set your sights even more northward, you can consider a drive up the coast from LA to San Francisco along the PCH. This scenic drive is long (440 miles) and will take you 8-plus hours, so plan on breaking up the drive by at least two days to truly enjoy the vistas.